‘Tis the season of scary stuff: ghosts and ghouls; tricking and treating; spooky spiders and other freaky frights. Virtual vanishings. I recently downloaded Yosemite – Apple’s new operating system. It’s free so I thought, yah, and then the thousands of photos I have stored on my MacBook went AWOL when I could no longer access iPhoto, so I thought, ?@*!. Cue a lengthy phone call to Apple after which I can once again open iPhoto. Praise be because I have no copies virtual or otherwise of said photos. I have learnt a salutary lesson on the importance of back up and so I don’t panic next time something similar happens I have just ordered an external hard drive. Jokes. Or, I should say, jokes that I don’t find funny. I am total rubbish at fake laughter. ID’s and passwords. Life was so much simpler back in the day when multiple log in’s weren’t part of daily life. Mostly I write these gatekeepers to online life down but sometimes, having greater faith in my memory than is warranted, I don’t. Thank heaven for the forgot password button on most sites. Oh I love Halloween, we have so much fun here in my neighborhood. I was thinking of loading Yosemite, now I am thinking not. Can’t afford to lose my photo’s no external memory here. Great post!! I like it too with it’s autumnal themed decorations. Some people have gone to town and whole houses are decked out in Halloween bits and bobs so there is loads to look at when I am out walking. I probably didn’t make it clear in the post but I was re-united with my photos. When I updated to Yosemite, I was asked to upgrade iPhoto but when I tried I got an error message and I couldn’t access the old version either. When I spoke to Apple the solution was to move the iPhoto in my applications folder to trash, empty trash (I worried were my photos gone for ever) and then download IPhoto again from the App store. Magically once iPhoto was re-installed I had access to my images again. The person I spoke to (Bradley) at Apple was very helpful but it all took a long time as he had to check things out with his colleagues. I love the photo of the door with the ghost. Your hens were very discerning. And how scary it is to hear that the lemon and orange skins never rotted down. I am with you on the wax on lemon skins, I always try to find unwaxed ones. Oh, and I also managed to delete all my playlists from itunes. 😦 That was last week. Very much so. Actually I downloaded some of Mike Howe’s music. Do you follow his blog? Much sympathy at your Apple upgrade scare. There has been much cursing in this household too as Apple wreaked its worst!! Back up that portfolio. Happy Halloweeen. G.
Very scary indeed! But thankfully all ended well. Your new profile pic is lovely – the wedding dress? I hope you will post some pictures of the day on the blog. I bet that little episode took ten years off your life!!! I must get one of those gizmos for myself. Keep up the good work. 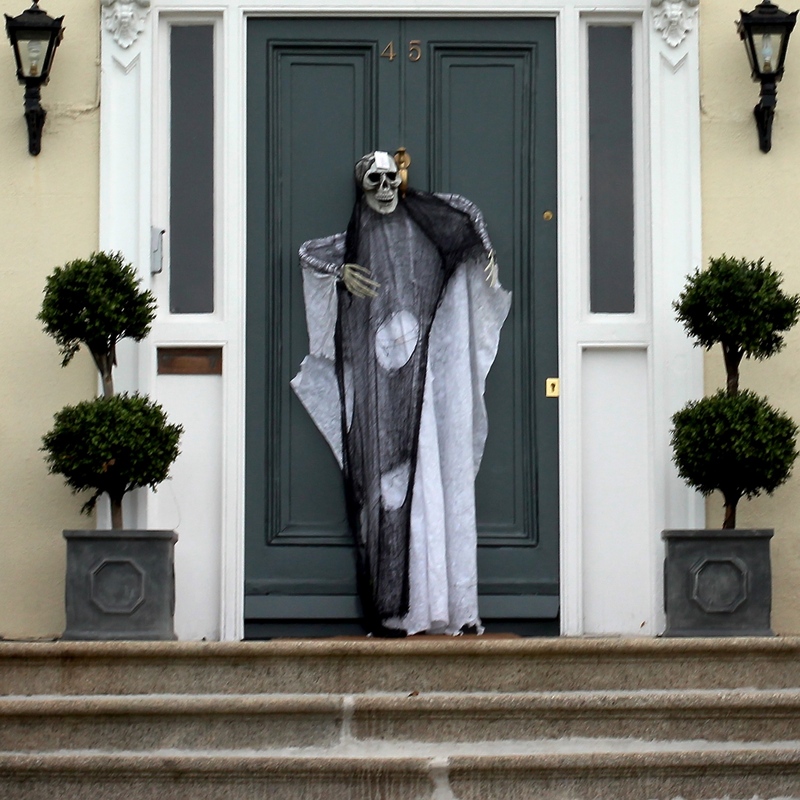 The door with the skeleton looks great! I’ve never seen lemons without pips! This is the first halloween we have neighbours in walking distance and I hope nobody knocks our door on friday because we have nothing prepared:) That’s scary. I hope you had a lovely Halloween. I was unprepared as well. Last year I bought a load of sweets and chocolate bars and no one call so this year I didn’t get anything in. And, of course, then a few people called! 1. I have automated backups and two manual backups. I never, ever store anything in any cloud other than set up by me/ the boyfriend. Speaking of horrors, I’ve discovered – late to the party – the BBC crime series called Ripper Street. Set in Victorian London, shot entirely in Dublin! Hello and no, I haven’t seen Ripper Street but I can well imagine that parts of Dublin could easily be used as a stand in for Victorian London. Speaking of tech, how is your photography course going? Your list is definitely the scariest I’ve read today! Because for me, real life is scarier than fantasy. Actually, it’s more of everything than virtual or imaginary life.